Nye zhuritzi chloptzi shtoh s'nami budiet mi paidem nuh karchunki tam ie vodka budiet. Don't worry, fellows, about what will become of us. We will travel to an inn; over there will surely be vodka. 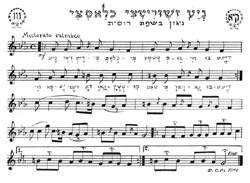 A carefree, Joyous melody, dating from the time of the second Chabad Rebbe, the Mitteler Rebbe. Originally sung by his Chassidim as they traveled the road to Lubavitch on their way to visit the Rebbe. Symbolically, the words reveal the deep devotion of the Chassidim to their Rebbe. When they arrive at Lubavitch, they will lack nothing. Was singing this at work today. shto zhe s nami budiet. Mi pajediem da karchyomki - tam ie vodka budiet! Что же с нами будет. Correct translation A bit wrong translation.